Safe-Green has Excitation Wavelength of 490nm and Emission Wavelength of 525nm, and its sensitivity range is between 0.2-0.6ng. Safe-Red has Excitation Wavelength of 540nm and Emission Wavelength of 630nm, and its sensitivity range is between 0.3-0.8ng. Safe-White has Excitation Wavelength of 370nm and Emission Wavelength of 470nm, and its sensitivity range is between 0.2-0.5ng. SafeView Classic emits green fluorescence when bound to dsDNA and ssDNA and red fluorescence when bound to RNA. This stain has one excitation (490 nm) and two emission spectra (520 nm and 635 nm) and the sensitivity range is between 0.1-0.3ng. SafeView Plus has Excitation Wavelength of 490nm and Emission Wavelength of 525nm and its sensitivity range is between 0.05-0.1ng. G108 does have 2 emission wavelengths, but only one excitation. G108-G has only one excitation and one emission wavelength. Safe-Green (G108-G) has Excitation Wavelength of 490nm and Emission Wavelength of 525nm, and its sensitivity range is between 0.2-0.6ng. Safe-Red (G108-R) has Excitation Wavelength of 540nm and Emission Wavelength of 630nm, and its sensitivity range is between 0.3-0.8ng. Safe-White (G108-W) has Excitation Wavelength of 370nm and Emission Wavelength of 470nm, and its sensitivity range is between 0.2-0.5ng. 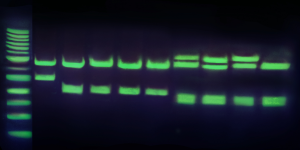 SafeView (G108) Classic emits green fluorescence when bound to dsDNA and ssDNA and red fluorescence when bound to RNA. This stain has one excitation (490 nm) and two emission spectra (520 nm and 635 nm) and the sensitivity range is between 0.1-0.3ng. SafeView Plus (G468) has Excitation Wavelength of 490nm and Emission Wavelength of 525nm and its sensitivity range is between 0.05-0.1ng.